ELEMENTA takes inspiration from winter and Copenhagen. Through the use of light, elements of this season and the city will be reproduced. They will follow one another, creating a flow of movements and patterns, giving a calming and interesting atmosphere to the surroundings. The scenarios are going to be four: wind, water, fire and snow. Wind and snow are characteristic weather conditions during winter. On the other hand, the fire represents hope and comfort during the dark evenings. The water is an intrinsic quality of Copenhagen. The light will reproduce the colour palettes and the movements of these four elements. The work and visualisation is made by the Italian lighting designers Clarissa Concilio and Paolo Rota, who are both based in Copenhagen. 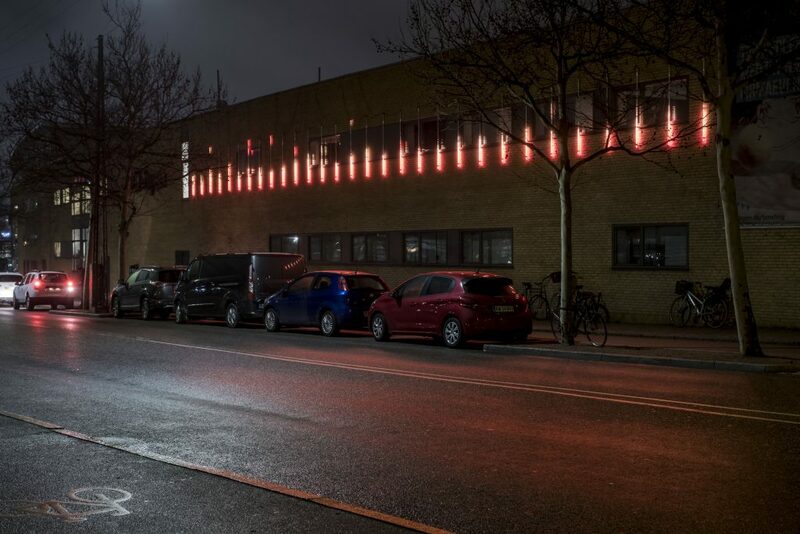 The installation is 2 x 15 meters long and consisting 30 programmable LED tubes with a distance in between on 50 cm. The work is situated on the busy Ingerslevsgade by Copenhagen Main Station and can be seen of train & bus passengers as well as pedestrians and road users.